This entry was posted in Alcohol, Success Story and tagged Substance Abuse on March 12, 2013 by ATMC Team. Without ATMC, I wouldn’t have had the knowledge or resilience to achieve this. Being an alcoholic and an addict who has braved the treatment center world twice before, you could imagine my skepticism when I arrived at ATMC. I had managed to stay on the wagon in the past but only for brief periods of time, still searching for the weak link in the chain. As I soon found out, their methods were anything from the standard lock-up style, spin dry rehabilitation center. I found the staff supportive and empathetic with my situation. They also had the utmost confidence in my abilities to get clean once and for all. I was enrolled in the sauna program which ran congruent with supplementation and nutritional guidance. The relaxed environment was crucial to my recovery as anxiety is a symptom of my lifestyle choices. The staff encouraged my continuation of Alcoholics Anonymous and other programs, which aren’t required but respected. It was an exhausting process which seemed to worsen my condition until I started to feel like my old self again. When I say “my old self,” I am referring to how I felt as a young man before the alcohol and drug fueled partying took over my life…the kind of physical and mental alignment that I hadn’t experienced in years and one that I thought impossible to return to. I was grateful for the opportunity to better myself and hopefully the people around me. I left with a blueprint for sobriety that I finally felt worked for me, or to put it simpler, there were no weak links in the chain. 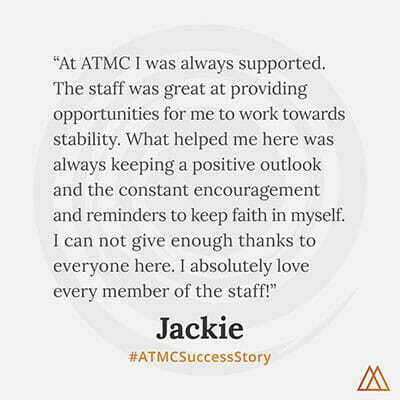 Without ATMC, I wouldn’t have had the knowledge or resilience to achieve this.